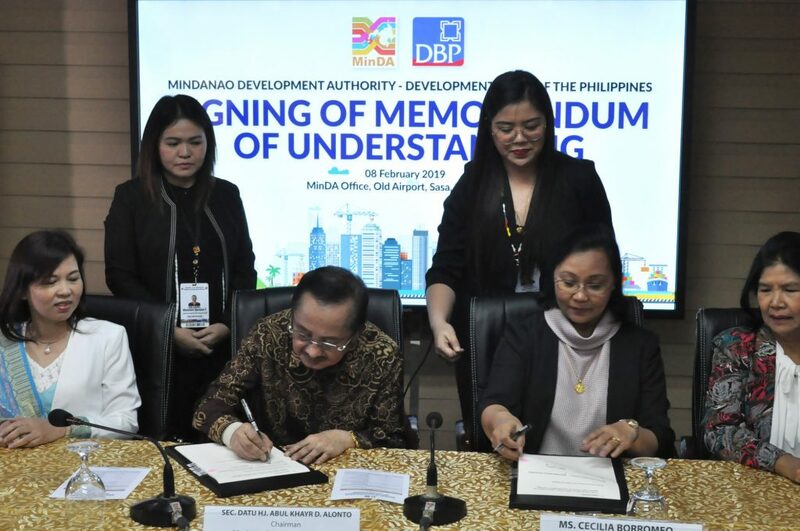 The Development Bank of the Philippines (DBP), being one of the support bank of the government’s Build Build Build Project, formalized its partnership with the Mindanao Development Authority (MinDA),to expedite development projects for the island. A Memorandum of Understanding (MOU) – signing took place on Friday morning, at MinDA office in Sasa, Davao City, by key officials led by MinDA chairman Secretary Abul Khayr Alonto and DBP chief executive officer and president Cecilia Borromeo. DBP chairman Alberto Romulo arrived in Davao City for the signing, but was not feeling well last Friday. His remark was read by former Vice Mayor Luis C. Bonguyan, DBP director. The partnership, stated in the MOU, will help fasttrack MinDA’s flagship project and programs, which were approved as part of the Philippine Development Plan for 2017-2022. These include the Trans-Mindanao High Speed Railway System, Mindanao Development Corridor (MinDC) Airports, MinDC Seaports and MinDC Agro-Economic Zones. “DBP will be offering financial advisory services to help MinDA evaluate projects that will further develop Mindanao,” Borromeo said. She said that the 72 years of DBP’s operation will be an edge as the bank had experiences in financial advisory, including evaluation of projects to be prioritized and how to financially structure the projects in the bank’s pipeline. However, Borromeo said that the MOU will not be limited to consultancy services. “If there is a need for DBP to finance these projects, we are prepared, either to the private sector participants, or to other government agencies, that will take part in the projects approved by MinDA,” she said. MinDA executive director Janet Lopoz said that the partnership is a big help in the development of Mindanao, as it takes pride of having a 7.1 percent Gross Regional Domestic Product (GRDP) in 2017, higher than the 6.7 percent national rate. The growth rate was based on the Philippine Statistics Authority (PSA) data. “It is a doubling challenge for MinDA to maximize its efforts for this growth to be shared to all Mindanawons,” Lopoz said. The MOU is also one of the highlights in MinDA’s ninth anniversary, happening on February 18.